Continuing on with our year of wacky weather, April seems to have returned to New England. We’ve had about 2 1/2 inches of rain in the past week, and on Monday we had a high temperature of 57 degrees! It’s hard to believe that in March we were worried about drought. Though we have had a few breaks of sunshine, there have been a lot of cloudy, dreary days lately. The tomatoes and peppers are growing slowly, but the greens don’t seem to mind this weather much. 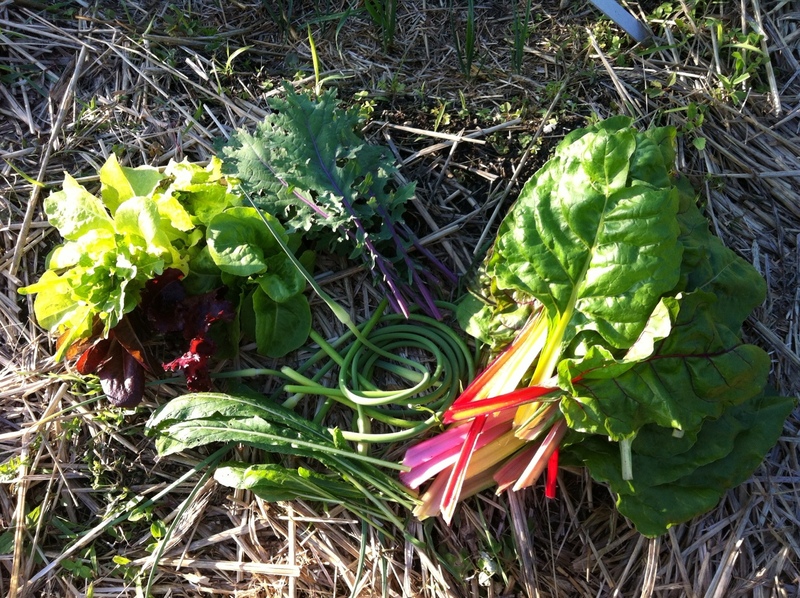 Yesterday I harvested a big pile of lettuce, a little kale and mibuna, and a big bunch of chard. The critters still seem to be enjoying the chard, but it’s growing fast enough that there’s still plenty left for me. The peas on the other hand are taking their sweet time. In theory I should have been harvesting shelling peas three weeks ago. So far I’ve harvested one pod. It had three peas in it. There are lots of pods on the vines, and every day I look at them and think, tomorrow there will be peas to harvest. But they’re just not quite there yet. The sugar snaps are getting very close. When I was in San Francisco last month, at my friends Stella and Vicent’s house we had fresh sugar snap peas steamed and simply dressed with olive oil and salt and pepper. They were so sweet and delicious, I haven’t stopped thinking about them and it’s making me all the more impatient. Posted on June 5, 2012 by kate. This entry was posted in Gardening and tagged chard, food, gardening, garlic scapes, harvest, kale, lettuce, mibuna, Peas, weather. Bookmark the permalink. Our peas are slow this year as well. We don’t even have any pods. Gave them fencing this week and hoping for the best. The spinach in the rows next to them bolted so with them gone perhaps more sun will get in. On the other hand, we had our first cucumbers last night. They don’t even resemble what passes for cukes in the produce department of the grocery store. Love the photos! Wow, cucumbers already?! We’re a long way from harvesting cucumbers! Yes, please. Peas, please. (Try that four times fast..) Lovely harvest. 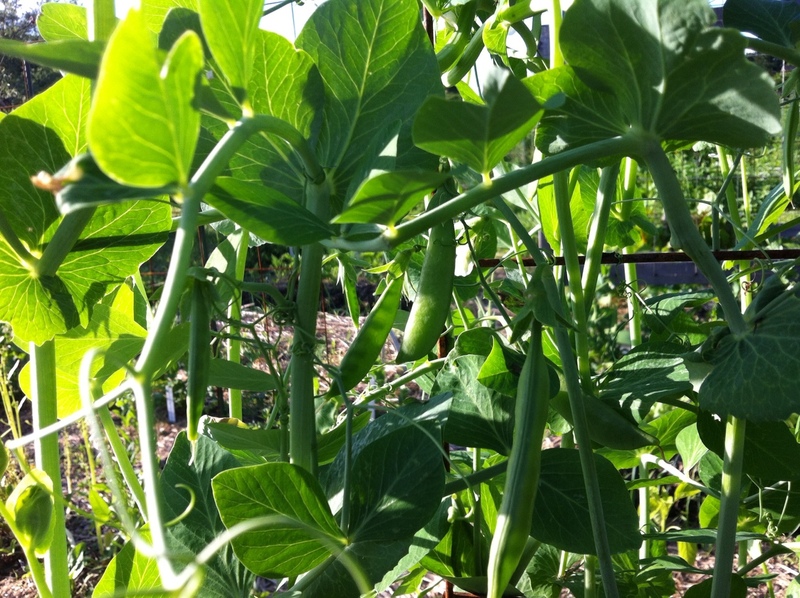 Great blog…look forward to reading more..
Peas were late here, too, in California — we usually get them in March or April. Now we have plenty though (and plenty of chard!). I understand your impatience! My peas are very late this year as well, I grow climbing heritage peas and they have barely got started, a few flowers so far but not a single sight of a pea pod yet.